The sci-fi flick Passengers sure didn't stick around long in theatres, but that's good news if you're a home video aficionado, especially since the movie has been given a welcome 4K UHD release that's quite spectacular. Even better, above and beyond its excellent home theatre credentials, Passengers also offers an interesting and thought-provoking story and terrific performances by lead actors Jennifer Lawrence and Chris Pratt who play literally (well…) star crossed lovers who must cope with their own "Kobyashi Maru-type" of no-win scenario. It's a shame that this movie didn't even make back the studio's initial investment (home video sales not counted of course) because it's far better than the awful and pretentious sci-fi flick Arrival, which preceded it into theatres and which I really wanted to like (except that it sucked). According to IMDB, Arrival had the nerve to make a profit, too - $100,501,349 box office compared to a $47,000,000 production cost - and yet it isn't worthy of shining Passengers' shoes, a film which IMDB said cost $110 million but only made just over $99 megabucks. In Passengers, we join the starship Avalon and its cargo of 5,000 hibernating colonist passengers and 258 hibernating crew as it travels through deep space on its 120 year journey from Earth to a "Homestead Colony" where they plan to build new lives. You'd think there'd be at least a night watchman on duty just in case, but nooooo! - this ship is so computerized (not surprisingly, really, for the future) that it's totally self-contained and self-maintaining. It's a pretty cool ship, too, basically a luxury cruise ship/hotel with huge and spinning partial wheel sections reminiscent of the space station in 2001: a space odyssey. The spinning sections offer simulated gravity for the people on board who, other than their short period awake at the beginning and end of their long voyage, don't really need it. But Passengers would be less cool without it. That's a bit of a plot hole, I guess, but plot holes are common in science fiction. Heck, there'd be no Star Trek without 'em! Anyway, the ship has a defensive shield in front of it to prevent damage from collision with space debris but, wouldn't you know, it runs into an asteroid field denser than what it was apparently designed to handle. This starts a series of events that leads to renewed life, hopeless loneliness, true and deep love, true and deep hate, personal sacrifice, rebirth (kind of) and lives fulfilled. And that's just the first five minutes! I jest, of course. The asteroid incident happens in about the first five minutes, but it's merely the situation that sets up the rest of the story, which unfolds in a rather leisurely but never boring manner. As you might expect, the collision has messed up something on board the Avalon and small malfunctions begin to rear their ugly cybernetic heads. One of the first malfunctions causes the premature awakening from hibernation of passenger Jim Preston (Pratt), a mechanic on his way to a new adventure on the new world. But only he is awakened, forcing to spend the next year "alone" on the ship, bored and desperately lonely despite all the luxuries and amenities surrounding him. And since his awakening is about 90 years ahead of schedule, and he doesn't know how to get back into the deep sleep of hibernation, he's faced with the prospect of having to live out the rest of his life there, alone, surrounded by all the people he could ever want to hang out with, but can't because they're all dead to the world. It's kind of like the situation at the end of 2001 when Dave Bowman lives out the rest of his life as a human in what's apparently a luxury hotel suite. It's also a bit reminiscent of Jack Torrance in The Shining, as he (and his family) spends the winter in an abandoned luxury hotel. Heck, there's even a bartender (played well by Michael Sheen) that, if he weren't an android, would almost be a dead ringer for Joe Turkel's Lloyd, the ghostly bartender at the Overlook hotel. But don't think this movie is nothing but rip offs or, to be kind, homages; it isn't. It's a good story on its own, even though there aren't very many real surprises in it. Where does Jennifer Lawrence's character, Aurora, come from? Well, Jim's a pretty desolate dude living in his lonely luxury and interacting only with computerized personalities that are annoyingly obliging - kind of like the voice systems in today's cars. And while you may be able to guess what happens to bring Lawrence into the movie, it's handled very well and takes seriously the ethical and moral issues surrounding the actions of the characters. I laughed at the ship's computer systems because they make complete sense given the way today's tech is going: they bend over backwards, figuratively of course (except for the bartender, who can actually bend), to be helpful and accommodating, but if you run into something they don't - or can't or won't - understand they're as frustratingly unhelpful as the endless and annoying menus on a current company's customer "service" phone line. This even applies to Arthur, the bartender, who's great at his job and at the small talk one might expect from the friendly neighbourhood barkeep - but "he" also screws things up mightily thanks to his ultra-logical way of processing new information. Naturally, the ship's glitches become more severe as the movie unfolds, to the point where they threaten the entire mission and its people, forcing Jim and Aurora to figure out a way to fix it, even though it's outside of their knowledge and experience. Fortunately they find some help along the way. Passengers is not only a good story, it's full of beautiful scenes inside and outside the ship, including some gorgeous shots that were so vertiginous my dear wife had to look away (the bigger the screen you have the better!). You can see the climax coming from a light year away but that doesn't spoil the film. Sony's 4K Ultra HD disc package is a full meal deal, except for the lack of a DVD (and I can't imagine people looking for the 4K disc will care about that). It comes with a 4K UHD HDR disc that looks and sounds gorgeous, as well as excellent 3D and 2D Blu-rays and a code for a digital copy download. 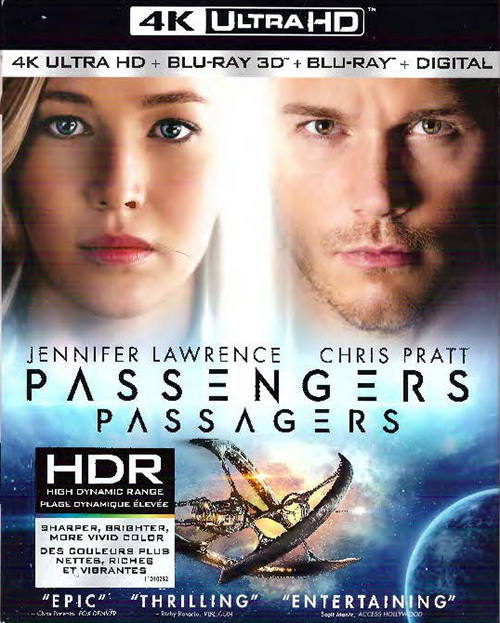 We watched Passengers' 4K UHD (HDR) disc on LG's fantastic 65 inch OLED 4K TV (watch for my full review of it in a few weeks), played on Oppo Digital's lovely UHD-203 4K universal disc player and the picture would have knocked off my socks if I'd been wearing any. I kid you not; Passengers looks fantastic! The image, which was apparently shot digitally, is among the best I've seen on a 4K disc so far. Some shots don't really take full advantage of the 4K, but when there is texture and fine detail on screen - faces, costumes, close-ups, etc. - it's fantastic, with rich and stable colours and black levels that threaten to pop off the screen even though the 4K picture isn't 3D. The 3D Blu-ray is an excellent example of the species as well. I generally couldn't care less about 3D, but there's some really neat stuff here, especially the vertiginous stuff my wife hated. The regular 1080p Blu-ray is also very good, but if you have the capability to play the 4K HDR disc it's the obvious choice. If you don't yet have 4K, the 4K disc will hibernate happily in the package until you do have the capability; in the meantime you'll undoubtedly enjoy the excellent "lower quality" of the Blu-ray versions. The 4K disc's sound comes in Dolby Atmos, which "dumbs itself down" to Dolby TrueHD in home theatres that don't have Atmos, and the Dolby TrueHD sound quality is just fine, immersive and dynamic. The DTS-HD Master Audio track you get on the 1080p Blu-rays is also very good. Extras, which are found on the regular 1080p Blu-ray disc, are decent but not outstanding. There are some deleted scenes, a bit on the actors, a couple of shorties that look at the special effects and design, a bit with Chris Pratt, outtakes, fake ads for potential emigrees, and some trailers. Passengers won't go down in movie history as a ground-breaking film such as 2001: a space odyssey, Forbidden Planet or even Star Wars, but it's a surprisingly enjoyable flick that eschews mayhem and action (though there's some) to focus instead on a fairly intimate story set against the vastness of interstellar space. And, especially in its 4K incarnation, it looks and sounds fantastic in the home theatre. This is definitely a disc you'll want to use to make your friends jealous. Note: for these reviews, I used Panasonic's 4K TC-55CX850U 55 inch 4K TV coupled with Oppo Digital's UHD 203 player.